On a weekend boating excursion, husband and wife, Rob and Pia become lost and end up in the most unlikely place, a thick brush filled marsh, on an island in the middle of nowhere. With their boat in disarray, darkness coming on, and a heavy thunderstorm starting up, their only solution is to look for help or seek shelter of some kind. 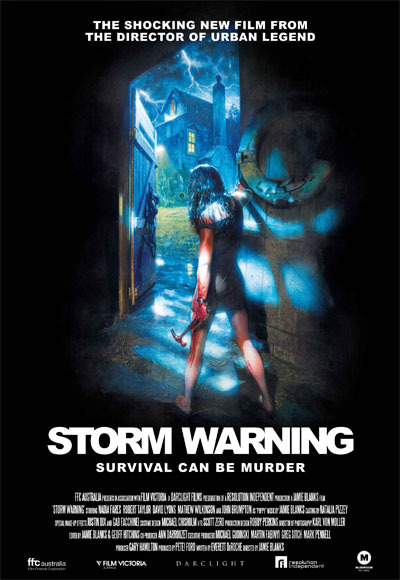 There has been some great Horror films to come out of Australia, this film is one of the most entertaining and gory I've seen for a while. The story doesn't hold back and it's a thrill ride for the viewer. I've always loved a good Horror film about hill-billies, I don't know why but they've always entertained me, maybe it's because deep down we all have a sense of fear of something happening to us if we went into the wilderness, well we definitely have ever since "Deliverance" anyway. This film manages to heighten that fear by showing us scenes that are truly disturbing to watch. The director, Jamie Blanks, does a great job of making us feel for the couple, so when they're thrown in-to some awful situations you feel true compassion for these characters. The film has the usual Hill-billy clichés but don't let that deter you away from it, if anything embrace them because it just amplifies the fear factor of it all. The film got classed as a b-movie but you wouldn't think of it as that once you see it. The film is incredibly well shot and the effects are just as good as anything Hollywood can do. One thing that surprised me with this film was even though there is a-lot of gore use it doesn't take anything away from the film and it isn't used to cover up a paper thin plot which you see so much of with a-lot of today's Horror films, if anything it's used the way it should be, to terrify, sicken and be on par with the film. This film delivers with more than a punch, if you enjoy films in the nature of "The Hills Have Eyes" and "Wrong Turn" then you can't go wrong with this.